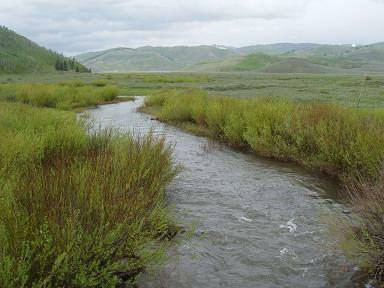 The Strawberry River is a tributary to Strawberry Reservoir. It has a population of Bear Lake Cutthroat Trout that have migrated from the reservoir into the stream. The trout also spawn here as well, and some of those spawners are captured by the DWR and their eggs are harvested to be raised in state fish hatcheries. This water has	some strict regulations, including some sections closed all year, and the rest being closed part of the year to protect spawning Cutthroat Trout and Kokanee Salmon, as well as artificial flies and lures only restrictions, so be sure to check the current fishing proclamation before you go. Also, don't overlook the river below Strawberry Reservoir, where it flows in the Uinta Basin. This river has some excellent fishing and lots of solitude. CLOSED TO FISHING ALL YEAR (Note: This road begins about two miles	west of the Forest Service Visitor Center on US-40 heading south. Closed to fishing May 15 through 6:00 a.m. on the 2nd Saturday of July, and Sept. 1 through 6:00 a.m. on the 2nd Saturday of	October. Make sure to wear dull colors so as to not prematurely spook fish in this clear, high-elevation stream. Polarized sunglasses can also be very helpful in reducing glare on the water so that you can spot trout in the water easier.